[In order to get the best deal in price and shipping for buying two, 8.5 oz packs, please select the 17 oz item (it comes in two 8.5 oz packs).] 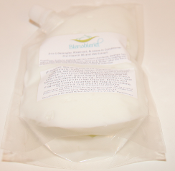 Blensblend 3-in-1 Detangler, Rinse-out, and Leave-in Conditioner, with Pro-Vitamin B5, Oat Extract, and excellent conditioning alcohols (non-drying alcohols). It is a slippery, thick, conditioner with excellent hydrating, detangling, and moisturizing abilities. It is a concentrated conditioner and works best with lots of water (on soaking wet hair). The flexible packaging allows the pouches to fit into a variety of shipping boxes/packages making the least expensive shipping options available. Plastic packs are made of food grade plastic. Please note: This conditioner is a concentrated conditioner. It is meant to be used on soaking wet hair and then once the conditioner has been applied more water should be surged on top of the applied conditioner. It is not meant to be applied to hair that is dry (non-wet hair). No Mineral Oil. No Artificial Colors No Parabens, No Silicones No Petrolatum No Formaldehyde. No Pthalates No Animal Products No Animal Testing Please allow 2-10 days for delivery. Blensblend 3-in-1 Detangler, Rinse-out, and Leave-in Conditioner, with Pro-Vitamin B5, Oat Extract, and excellent conditioning alcohols. It is a slippery, thick, conditioner with excellent hydrating, detangling, and moisturizing abilities. No Mineral Oil No Artificial Colors, No Parablens, No Silicones No Petrolatum No Formaldehyde No Pthalates No Animal Products No Animal Testing The flexible packaging allows the pouches to fit into a variety of shipping boxes/packages making the least expensive shipping options available. Plastic packs are made of food grade plastic. Shelf life is 1 year from the date of purchase. The optimal place for storage is in a cool dry place away from prolonged direct sunlight. For dispensing simply lay pack flat and press the top of the pack with one hand to dispense in other hand. Excellent for curly hair! Instructions provided explain how to use depending on whether your hair tends to be naturally dry or oily. General Directions: Apply to soaking wet hair, evenly distribute, surge with water, detangle hair with a detangling comb, and rinse. Apply as a leave-in to soaking wet hair. For curly and/or naturally dry hair, add 'Blensblend Hair and Body Butter' after the leave-in application for additional protection, shine, and definition. This conditioner is thick and concentrated, the way I use it: I apply it to soaking wet hair (not just hair that has been sprayed down), then I surge my hair with a bit more water to fully hydrate the conditioner and then I detangle, rinse, then shampoo, then condition, and apply as a leave-in (still to soaking wet hair). Naturally dry Hair, processed hair, and color treated hair: Use as as detangler on soaking wet hair. Use as a rinse-out conditioner as well as a leave-in conditioner. Normal to Oily Hair: Apply to soaking wet hair, leave in for 3 minutes and rinse. Use as directed. Shelf life is 1 year from the date of purchase. The optimal place for storage is in a cool dry place away from prolonged direct sunlight. For dispensing simply lay pack flat and press the top of the pack with one hand to dispense in other hand. Please allow 2-10 days for delivery. *98% of ingredients are natural/naturally derived. Ingredients: Purified Water, Vitis Vinifera (Grape) Seed Oil, Behetrimonium Methosulfate, Cetearyl Alcohol (conditioning alcohol), Panthenol (Pro-Vitamin B5), (Vegetable) Glycerin, Emulsifying Wax NF, Cetyl Alcohol NF (conditioning alcohol), Avena Sativa (Oat) Extract, Prunus Ameniaca (Apricot) Kernel Oil, Phenoxyethanol, Guar Hydroxypropyltrimonium Chloride, Benzoic Acid, Dehyroacetic Acid, Fragrance oil(s), Tocopherol, Potassium Sorbate. Caprylyl Glycol and Sorbic Acid may be substituted for Benzoic Acid and Dehydroacetic Acid. *May contain trace amounts of Shea butter. Allergy alert: Processed in a facility that also processes nuts, seeds, oils, and other foods. Additional Ingredient: LOVE! Made in the U.S.A.